Tariffs go into effect after 15 days, with Canada and Mexico excluded for now. Defying critics, President Donald Trump has officially announced steep tariffs on aluminum and steel imports, exempting Canada and Mexico for now, and providing for possible exceptions for other U.S. allies. Steel imports would be hit with a 25 percent tariff, and aluminum imports with a 10 percent tariff. "Today I'm defending America's national security by placing tariffs on foreign imports of steel and aluminum," Trump said. "A strong steel and aluminum industry are vital to our national security. You don't have steel, you don't have a country," he said. "The American steel and aluminum industry has been ravaged by aggressive foreign trade practices, it's really an assault on our country," Trump said. "I'm delivering on a promise I made during the campaign," he added. Aluminum workers, joined by steelworkers from Pittsburgh - some with hard hats in hand - stood behind the president as he made the announcement. "About time, right?" 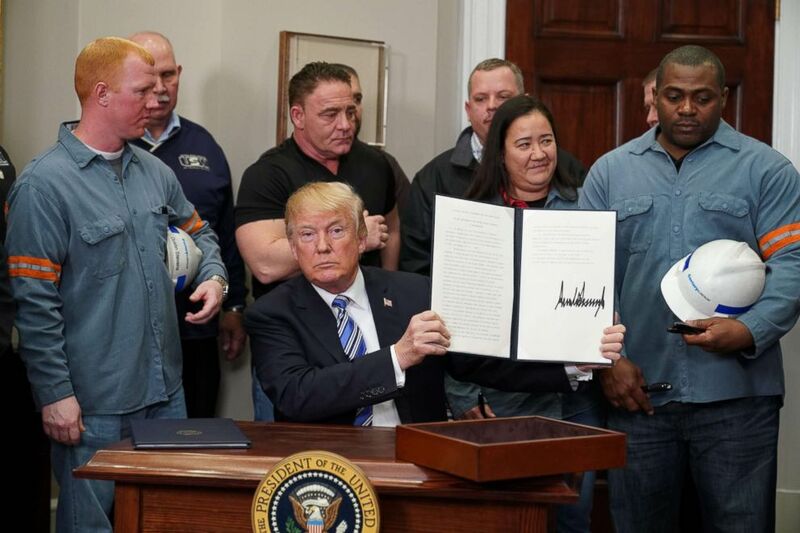 Trump said to steelworkers who gathered around his desk as he signed proclamations making the tariffs official. "You've been waiting for a long time," Trump replied. Trump was also joined by Vice President Mike Pence, Secretary of Commerce Wilbur Ross, Treasury Secretary Steve Mnuchin, U.S. Trade Representative Robert Lighthizer, and Peter Navarro, head of the White House's Office of Trade and Manufacturing Policy. After a chaotic 24 hours at the White House, during which administration officials weren't even sure Trump would follow through with imposing tariffs, Trump tweeted Thursday morning about a 3:30 p.m. meeting - that wasn't on his official schedule - about the steel and aluminum industries. Trump's decision to impose tariffs has divided the White House, angered Republicans on Capitol Hill, and could potentially alienate allies abroad. On Tuesday, Trump's National Economic Council Director Gary Cohn said he was resigning after losing the battle inside the White House over tariffs. And on Wednesday, leaders from Capitol Hill intensely lobbied the White House to reconsider. One hundred and eight Republicans led by House Ways and Means Chairman Kevin Brady wrote a letter to Trump expressing their concerns. But despite intense resistance, Trump went ahead with his decision. “We're going to be very fair, we're going to be very flexible but we're going to protect the American worker as I said I would do in my campaign,” Trump said earlier Thursday at a Cabinet meeting. (Mandel Ngan/AFP/Getty Images) President Donald Trump signs Section 232 Proclamations on Steel and Aluminum Imports in the Oval Office of the White House, March 8, 2018, in Washington. According to a senior White House official, the tariffs will go into effect in 15 days, with exceptions for Mexico and Canada for an indefinite period of time as the United States continues to engage in NAFTA negotiations. If Canada and Mexico are excluded permanently from the tariffs, a White House official said it may necessitate a bump in the tariffs percentages. "If Canada and Mexico were to be excluded we would perhaps maybe have to raise the tariffs on everybody else - and modestly I might add -- to ensure that our steel and aluminum industries are protected," the official said. The administration has used a national security justification under Section 232 of the Trade Expansion Act because steel and aluminum play an important role in our defense industry. Critics have warned that the tariffs could set off an international trade war, but the White House has said that the proclamations will potentially offer flexibility for more countries to gain exemptions. "The flexibility is designed both to accommodate our security relationships, but also ensure an ironclad way that we preserve our steel and aluminum industries in the interest of national security," the official said. But the Trade Partnership, an international trade and economic consulting firm, released a report Monday estimating that the proposed tariffs – 25 percent on steel imports and 10 percent on aluminum – would lead to a net job loss of almost 146 thousand jobs, which includes an uptick in steel and aluminum by 33 thousand jobs. They used the same model to arrive at these estimates that the Commerce Department used to make its arguments for these tariff rates. The report says that the services sector would be hit the hardest because households would be hit with higher costs for big items like cars and washing machines due to the tariffs. Reduced spending power leads to more frugality on services like education, entertainment and healthcare, which the Trade Partnership points out are on the “front lines” of the tariffs’ domestic impact. While experts warn about the downstream effects, the Trump administration is insisting that price increases on consumer and industrial goods will be minimal. They point to the costs of a can of soda, which an official said would only see a “cent and a half to two cent” increase, as well as the cost of a $330 million Boeing 777, which would go up by about $25 thousand due to steel tariffs. Some Republican lawmakers say the decision could roll back any economic benefits of tax reform and result in a net loss of jobs. "His recent tariff proposals would stall and ultimately undermine the progress he has made," said Sen. Chuck Grassley, R-Iowa, in an op-ed. "Imposing across-the-board tariffs would hurt America’s relationships with reliable trading partners and be detrimental to the nation’s economic success." "If you just look at steel, this plan will kill steel jobs in America," said Sen. Ben Sasse, R-Neb., on CBS News. Another industry bracing for the negative effects of the tariffs is the farming sector, which President Trump had pledged to defend and, broadly, whose rural-state members voted overwhelmingly for Trump in 2016. During a speech at the January American Farm Bureau convention in Nashville, Trump reiterated his intention to protect farmers, saying they were wise to support him over his opponent Hillary Clinton. “Oh, are you happy you voted for me. You are so lucky that I gave you that privilege. The other choice wasn’t going to work out too well for the farmers. Because we know that our farmers are our future,” Trump said. But some farmers are arguing that this decision jeopardizes that future. In an op-ed written with Sen. Ben Sasse, R-Neb., Nebraska Farm Bureau president Steve Nelson argued that agriculture workers will be hit doubly, first because they could be caught in the crossfire of a trade war, if countries like Canada and Mexico decide to retaliate. In Nebraska, those two countries are their biggest customers, Nelson wrote. An administration official said Thursday that Canada and Mexico would have temporary exceptions for an indefinite amount of time, but the announcement had already roiled officials from those countries during talks to tweak NAFTA last week. Farmers say their sheer overhead costs will increase by virtue of the equipment they use. “This is Economics 101. When the price of steel and aluminum goes up, farmers and ranchers will pay more for everything from combines to grain bins. Nobody farms with plastic tractors,” Nelson and Sasse wrote. Sasse is just one voice in a chorus of congressional Republicans who strongly object to the president’s announcement. Several groups of lawmakers have sent letters to Trump urging him to reconsider, including 108 Republican House members urging him to tailor the tariffs to only affect the most egregious abusers, namely China. Seven senators also wrote their own letter, including Sen. Joni Ernst, R-Iowa., the chairman of the Senate Armed Services Subcommittee on Emerging Threats and Capabilities. They warn about the tariffs’ adverse effect on national security, despite the White House’s making the exact opposite argument, justifying the tariffs by saying steel and aluminum production are a national security issue. “We remain concerned that imposing tariffs risks alienating key international partners that contribute to our ability to defend our nation and maintain international stability,” they wrote. Mere hours before Trump made his announcement, lawmakers were still lobbying him trying to convince him to reverse course. Sen. Orrin Hatch, R-Utah, the chairman of the Senate Finance Committee, said he spoke to Trump Thursday and Wednesday trying to persuade him to change his mind. But even before Trump made the announcement official at his White House event, at least one lawmaker was already working on a bill to thwart him. Sen. Jeff Flake announced Thursday afternoon that he would introduce a bill to nullify the tariffs, with details expected after Trump’s event. And at an event Atlanta, about a half hour before the White House event, House Speaker Paul Ryan, who has been trying to steer the president away from the tariffs for days, was asked what Congress can do to help narrow the scope of the tariffs. "We're working on it," Ryan said, without providing further explanation.